She was born in New Orleans, Louisiana and raised in Atlanta, Georgia. 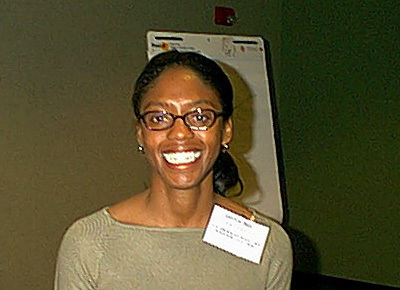 Employment (2008): Research staff member in Numerical Analysis Group at the IBM T.J. Watson Research Center in Yorktown Heights, NY. Dr. Dent was born New Orleans, Louisiana and raised in Atlanta, Georgia. She received her B.S. in mathematics from the University of Georgia at Athens. She then received a Masters degree in mathematics from Clark Atlanta University and finally a Ph.D. in applied mathematics from Brown University's Division of Applied Mathematics in May 1999. Her area of research is fluid dynamics. Her work focuses on the simulation of dispersed two phase flows and she is interested in applications to bio-fluids and mathematical finance. She is a research staff member in the Numerical Analysis Group at the IBM T.J. Watson Research Center in Yorktown Heights, NY. Area of research is fluid dynamics. Her work focuses on the simulation of dispersed two phase flows and she is interested in applications to bio-fluids and mathematical finance. Abstract of Ph.D. thesis: The purpose of these studies is to examine dilute two-phase flows at finite Reynolds numbers along two main themes. First, to investigate the sedimentation of solid particles arranged in a regular periodic lattice and to determine both sedimentation rates and flow characteristics over a range of finite Reynolds numbers and particle concentrations up to 20%. This is a canonical problem in sedimentation theory and should provide useful insights into the dynamics of two-phase flow. Second, to investigate a simplified, approximate method for calculating dispersed two-phase flow using a force-coupling model that employs the fluid force on the individual particles to represent the particulate phase as a distributed body force action on the fluid phase. This makes the equations of motion for finite Reynolds number flows suitable to be solved numerically, and to be independent of the choice of algorithms. A spectral/hp element direct numerical method is also used to solve the time dependent Navier-Stokes equations for flow through periodic arrays of cylindrical and spherical particles. The DNS calculations more accurately model the flow dynamics and is used to validate the results of the force-coupling model. The two dimensional problem was used as a test of the DNS and the results agree well with those of other numerical simulations. Analyzing the three dimensional problem proved to be informative. Determining the relationships between the superficial velocity or sedimentation velocity, the external force on the particles and flow structure as the volume fraction and Reynolds number are varied were the main goals. For Stokes flow conditions the sedimentation velocity decreases as the volume fraction is increased. At finite Reynolds numbers, this is countered by an interaction between the particles and the wakes when the system is dilute. As the volume fraction increases, the velocity is hindered by the particles and the settling rate decreases so that the flow experiences a blocking effect. Flow separation is delayed till higher Reynolds numbers. Comparing the force-coupling model for spherical particle motion in dilute flows to the DNS show that it successfully captures the flow dynamics and reproduces observed flow characteristics from experimental data as well. As a first approximation method it proves to be efficient and consistent. 3. G.L. Dent, and M.R. Maxey, Particle Sedimentation in Dilute Flows at Finite Reynolds Numbers. Bulletin of American Physical Society, 44, No.8, p. 48, 1999. 1. M.R. Maxey and G.L. Dent Force-coupled simulations of particulate flows: random suspensions.